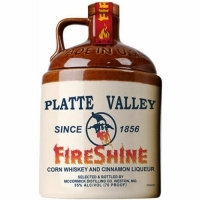 Platte Valley FireShine is a 70-proof blend Platte Valley Moonshine and cinnamon liqueur - spicy, hot cinnamon. The flavor combination is nearly flawless. Regardless of whether it's served neat as shot or as an integral ingredient in a mixed drink or specialty cocktail, FireShine provides a blast of incandescent fun.